For my 100th post, I would like to share a song that think is appropriate. Unlike the songs Fireworks and Born this Way, I will not cry when I hear this little diddy. I do think of Charlie Chaplin though, and the chin up, move on and smile on the way final image of the movie Modern Times. My favorite rendition of the song is Judy Garland's. When I hear it, I hear the voice of a mother letting her little darling know that they'll get by, if they just smile. I felt a little guilty about declaring that I preferred Ray Charles' version of Somewhere Over the Rainbow recently on my facebook page, so now I feel a bit redeemed. I admit, at times the song can seem a little somber, but the heartfelt voice of Judy strings the lyrics along and you get the feeling that she is taking on her child's heartbreak, that she would take all the heartbreak away if she could. While she is bearing the pain, she begins to uplift the spirit and empower the child. The song is a ballad of beauty with Judy's grace, elegance and meaningfulness. It's a song you don't want to have to sing to your kids, but would if it made everything better. 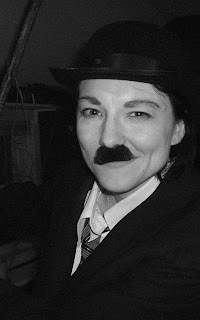 And for another smile.... Me, as Charlie Chaplin almost nine years ago at our Halloween party.